Geomagnetic Storms; including temporary disturbances of the Earth’s magnetic field resulting in disruptions of communication, navigation, and satellite systems (National Research Council et al., 1986). Fuel or Resource Shortage; resulting from supply chain breaks or secondary to other hazard events, for example (Mercer County, PA, 2005). Electromagnetic Pulse; originating from an explosion or fluctuating magnetic field and causing damaging current surges in electrical and electronic systems (Institute for Telecommunications Sciences, 1996). Information Technology Failure; due to software bugs, viruses, or improper use (Rainer Jr., et al, 1991). Ancillary Support Equipment; electrical generating, transmission, system-control, and distribution-system equipment for the energy industry (Hirst & Kirby, 1996). Public Works Failure; damage to or failure of highways, flood control systems, deep-water ports and harbors, public buildings, bridges, dams, for example (United States Senate Committee on Environment and Public Works, 2009). Utility interruptions occur throughout the Commonwealth but usually are small-scale, localized incidents. Utility interruptions are possible anywhere there is utility service. The U.S. Energy Information Administration (EIA) estimates that 51 percent of households use natural gas as their main heating fuel, while 22 percent use electricity to heat their home, and 18 percent use fuel oil (EIA, 2017), meaning a statewide utility interruption could cut heating or cooling to nearly 4.6 million households. In a possible worst-case scenario, a winter storm event causes widespread power outages, leaving citizens without heat in the midst of subzero temperatures. The power outage, lasting several days, also means that elderly populations or others at risk of health problems due to the lack of heat are unable to call for assistance or leave their homes. 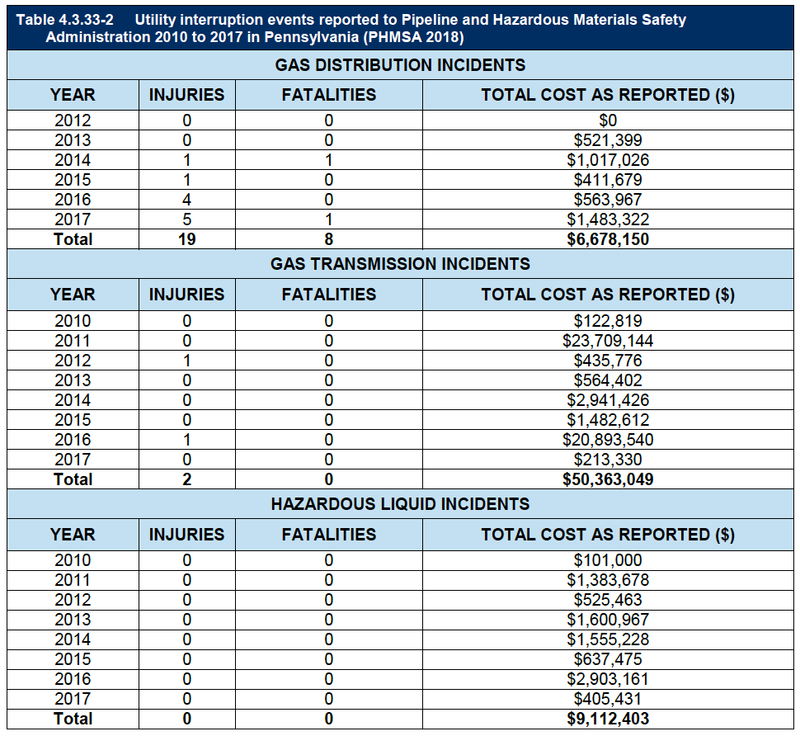 Utility interruptions are largely minor, routine events, but there have been several Presidential and Gubernatorial Disaster Declarations in which a utility interruption was a major component of a disaster. 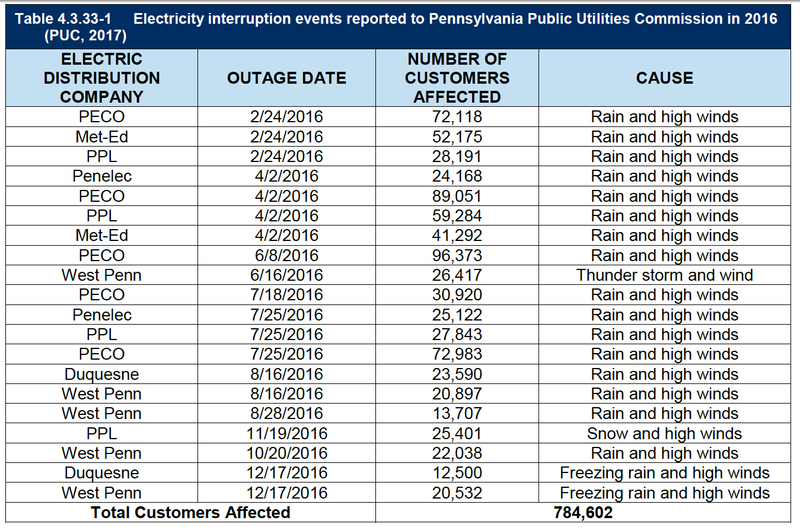 The Pennsylvania Public Utility Commission (PUC) reports that rain and high winds are the most common cause of utility interruptions. In 2016, 17 of the 20 electricity interruption events reported to PUC were caused by rain and high winds. These 20 events affected a total of 784,602 electricity customers in the course of the year. Widespread utility interruption events usually occur approximately once every five years, usually as a secondary effect of an extreme weather event. These interruptions should be anticipated and first responders should be prepared during severe weather events. Further, climate change may cause more extreme storms, like the March 2018 nor’easters, to occur in Pennsylvania (NOAA, 2018). Aging infrastructure also adds to the risk of potential utility interruptions. Population growth, urbanization and climate change can put strain on existing assets used to deliver utilities. In many utility systems, significant portions of the equipment and facilities date from the growth periods of the 1950’s and 1960’s that followed World War II. As this equipment ages, it deteriorates from the constant wear and tear of service. Liquid pipeline mileage per county (NPMS, 2018).